"Today's ball is livelier, that's for sure. And it will go a lot farther when it's hit." The team examined five major-league baseballs, one each from the years 1963, 1970, 1989, 1995, and 2000. They initially did simple bounce tests with the balls, then dissected each for detailed examination. During the whole-ball bounce tests, the two balls from 2000 and 1995 gave strikingly similar results; but those results were quite different from those of the other balls. 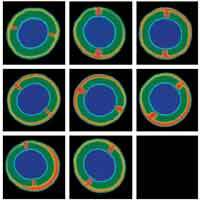 Later tests with the bare "pill" (ball core) showed very similar patterns. After the bounce tests, the dissected balls were given extensive laboratory examinations. URI chemists, engineers, and textile scientists closely examined various critical components of each ball to assess their possible effects on ball liveliness. Since the Rawlings specifications indicate woolen yarns should be used to construct the baseballs, the amount of non-wool fibers was surprising. The large amount of synthetic fiber in the balls from 1989, 1995, and 2000 is bound to affect the performance of the balls. If the synthetic fiber is polyester as we suspect, then it has good elasticity, resiliency, and loft. Although no tests exist to measure the performance of fibers used in baseballs, the synthetic materials could be expected to provide a liveliness to the ball that is not present in the balls of natural materials. Based on our tests, the manufacturer is not meeting Major League Baseball specifications for the balls. The composition of the inner-core yarns includes synthetic fibers, probably polyester. Rawlings specifies woolen yarn for the first, second, and third winds. The 1963 and 1970 balls fit the specifications better than the newer balls. Where there's any humidity, a ball wound with polyester would have greater elasticity and go farther than one wound with wool. In forensic science we want to compare items that are as much alike as possible, and we know that 37 years of heat, light, and moisture could affect the 1963 ball. We believe that the pill was well preserved because the windings and the cover protected it. We believe the pill is what gives the ball its resiliency. You wouldn't have known whether the age of the ball and the storage of the ball had affected it. I don't know that there is any study that can be done that is non-destructive that could concretely answer [whether older baseballs would travel less far than modern ones]. You can't go back to the past under the conditions that that ball was in and know for certain [if it would be different]. I would say the ball is the same, but I can't know for certain because there's no way to really go back and know the performance of that baseball. If we have to choose which of those two opinions to believe, we can look at the URI team's results (the UMass team has no results from older balls). Platek and Gregory conducted another series of bounce tests on the pills; the scientists conducted about 20 drops with each. They found that the average height of the bounces from the 1995 and 2000 pills, when dropped from a height of 182 inches, was 83 and 82 inches respectively. None of the pills from 1963, 1970, and 1989 averaged over 62 inches. The newer pills each bounced at least 1/3 higher than the older ones. So a five-year difference in age, from 1995 to 2000, seems to have had essentially no effect whatever on the pills. That does not necessarily extend to being a proof that 11 years has no effect, but it seems wildly unlikely (to me, anyway) that 5 years would produce zero effect but 11 years would produce a 25% fall-off in resiliency. In short, I know which of the two labs I believe about aging, and cannot see how, on the facts, anyone could disagree. The least stiff and most resilient by a dramatic amount were the 1995 and 2000 pills. [T]he design is unique among all years with a larger space between the two black rubber hemispheres. The cork area of the pills appears darker in the years 1989, 1995, and 2000 than that of the earlier years. In short, though the sample was small, just five balls, the margins were so huge and so consistent with what major-league power stats urgently suggest that it seems impossible for any intellectually honest reviewer to doubt that the ball has--by what way or ways is not crucial, though several seem apparent--been "juiced" in modern times. No one is arguing that any such juicing was deliberate--it very probably was not--but in complex manufacturing processes, things do happen over time. For example, the yarn used in Major League baseballs all comes from one company, which recovers the fibers as waste from carpet manufacturers worldwide. Says Professor Welters: "My guess would be that they're somehow getting a lot of polyester mulched into the mix, since it's very hard to find all-wool carpets being made these days." That change in the ball from the 1977 switch to the Rawlings ball seems indubitable. So also, just on this one study's evidence, is a change sometime from 1990 to 1995--which fits perfectly the 1993/1994 time frame that actual MLB power stats point to. This study comprised a series of CT (computed tomography) scans conducted by Universal Medical Systems (UMS) with the assistance of Dr. Avrami S. Grader and Dr. Philip M. Halleck from The Center for Quantitative Imaging at Pennsylvania State University. Beyond that release, there is a nice discussion of the matter available in a Jay Jaffe "Unfiltered" column at the Baseball Prospectus site. The study took cross-sectional images of major-league baseballs produced from 1915 to 2007. The method uses the differences in x-ray absorption of various materials to create contrast and reveal density in the images. The researchers used multi- and single-slice Philips CT scanners calibrated and tuned specifically to the size and material content of baseballs. This study has been reported and re-reported a great deal. Perhaps the longest article about it is "Getting Inside Baseball" (Matthew N. Skoufalos, Image magazine, March 19, 2007). From it, one thing that emerges is the combative personality of David Zavagno, president of Universal and the driving force behind the study. Zavagno is and long has been convinced that the ball has clearly been juiced. Meanwhile, MLB of course denies everything. Their mainstay in the juicing issue has been, as we saw farther above, the Baseball Research Center at UMass-Lowell, which pooh-poohs Zavagno's case. What is a disinterested observer to believe? And why? Zavagno may be his own worst enemy here, in that he is so vehement that his manner tends to predispose some to disbelief independent of what his actual, demonstrable facts may be. He seems to have a personal grudge, and that suggestion of bias never helps. On the other hand, the Center does not exactly come to the table with clean hands, either: it was founded by and is chiefly or wholly supported by money direct from MLB (and now also Rawlings, which makes the baseballs). Each side looks aghast at suggestions that they could be anything other than dispassionate scientists, but--as that article in Imaging weekly put it--"sometimes only the appearance of wrongdoing is enough to taint observers' opinions." Stripped of rhetorical excesses, here is what the two sides seem to be saying. 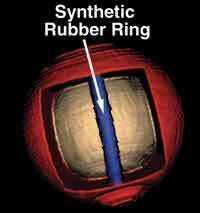 Imaging results reveal a baseball constructed with a synthetic rubber ring or spring not outlined in official MLB specifications. That ring acts as both a spring and a "stop" that directly affects restitution and energy distribution within the ball, meaning it will travel farther. Historically, baseballs have evolved in materials and construction with significant changes in the wool and core, and the addition of unregulated synthetic rubber rings. Comparing the specifications as published by Major League Baseball and the construction of the ball, one can clearly tell materials have been added that are not in the specifications. MLB specifications for the pill of the baseball state that it "shall consist of a compressed cork sphere surrounded by one layer of black rubber and one layer of red rubber." That last phrase seems to be the--pardon the expression--core of contention. 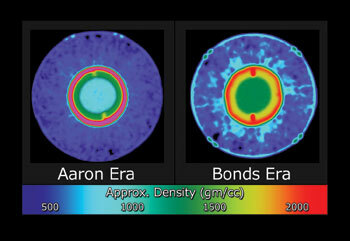 Images of balls from many different years clearly show substantial differences in construction. What they call an anomaly inside the pill of the baseball is material necessary to the construction, in that cork can't be put in a baseball in non-rubberized form else it would crumble. The nuclei of MLB baseballs are constructed in two semi-spherical halves that surround the cushioned cork center, one half red and one black. A stiff rubber washer surrounds the inner layer. What the scans see inside the balls are those centers. The ring that shows on the scans is a part of the ball that has been in the assembly as long as Rawlings has been making the ball; basically, it's almost like an O-ring spacer one would find in a faucet. What could account for the seeming differences observed between older baseballs and more recently constructed baseballs is attributable to technological improvements in the construction and materials of MLB balls: the pill is a different density rubber or plastic; it's not quite as stretchy and springy as some rubber is. Because it has that different density property, it would come across as this sort of beaming color on the CT scan. It's not surprising that it would show up as a different material than in the other balls. That would not necessarily define a difference in the construction of the baseballs from a manufacturing standpoint. "[The pill] is a different density rubber or plastic; it's not quite as stretchy and springy as some rubber is. Because it has that different density property, it would come across as this sort of beaming color on the CT scan. It's not surprising that it would show up as a different material than the other [baseballs]. "Rawlings has been assembling the ball for the last 30 or so years; prior to that, it was Spalding that produced the ball. Obviously, there've been technological improvements for greater consistency in the [yarn] winds and all that, but Rawlings has been making the ball without any changes in methods since they started. The construction of the ball is no different. OK, help me out here. How can he say the ball is "no different" right after saying there was "a different material" with a "different density property" used at differing times? Has my comprehension of the English language deserted me here? Different = No different? Say what? In any event, the 1999/2000 difference the Lowell lads examined completely lacks interest, being merely a straw man erected by MLB and Rawlings: no one at all is surprised that there were no perceptible differences, since even the most ardent ball-juicing advocates have nothing to say about that brief period. What is--or would have been--of interest is the 1992 - 1994 period, which is when, it is widely believed, there was a material change. Why didn't the Lowell lads look at that period? "I don't know that there is any study that can be done that is non-destructive that could concretely answer [whether older baseballs would travel less far than modern ones]. You can't go back to the past under the conditions that that ball was in and know for certain [if it would be different]. I would say the ball is the same, but I can't know for certain because there's no way to really go back and know the performance of that baseball." Meanwhile what it sounds like is that "without any changes in method" is being used as casuistry to cover differences in materials, though I really, really, really doubt that there have been no changes whatever even in "methods", since there is testimony available that in fact there have been such changes; even if they might be minor ("might" meaning we can't be sure, owing to the bizarre secrecy that surrounds these processes, including locked "secret" workrooms), the fact of any changes rather cripples the definitive Mr. Drane's credibility. I think that part of the "pro" camp's problem is their insistence that the balls are observably different from the nominal MLB specifications. That may well be true but also be irrelevant, in that MLB's utter inability to produce a "specification" that would not make any businessperson accustomed to technical specifications have an apoplectic fit of laughter does not mean that the balls themselves are constantly varying. As even MLB's pet laboratory noted, under MLB's specs as written, two balls both within spec could have travel distances varying by almost 50 feet under identical conditions. But, as they also noted, no real balls exhibit anything like that sort of variance (though even real balls vary by up to 7 feet in travel). The real focus is not on matching a grotesquely ill-written spec, it is on the degree to which the ongoing usual practices of manufacturing have or have not changed in some way, possibly quite minor-seeming to the maker (Rawlings), that has some material effect on travel distance. And the evidence--mark that word, evidence--is that they have. If Rawlings has something to hide, then why would it send its president down from St. Louis to conduct a media tour? As a former business executive, I will suggest that it is exactly when a company does have something to hide that it would be most likely to run out its big guns; if there's nothing, usually some flunky would be tabbed to run the punters through. Two respectable groups of well-credentialled scientists, using state-of-the-art tools and investing substantial amounts of time, have come to pretty much the same conclusions after examining actual baseball from different seasons. And their conclusions are also pretty much in line with each other and with what the actual statistics of major-league baseball strongly suggest. The URI study showed that baseballs from two well-separated years in the post-1993 era (1995 and 2000) were very like each other, yet very different from balls from pre-1993 years; it also showed significant categorical differences between the older Spalding and newer Rawlings balls. The Penn State study showed a marked increase in zip from 1977 on. All that agrees with the stats-indicated and common-sense indicated belief in a big jump when the ball maker was changed between 1976 and 1977, as well as the belief that there was a subsequent jump starting in 1993 and in full force in 1994. The UMass-Lowell studies at MLB's lab of the 1999/2000 balls signifies, as expected, nothing, since there was never any indication that the ball has changed since the 1994 season began. Those much-hyped results were, whether by design or ineptitude, simply a meaningless straw-man exercise. This page is one of several each providing a detailed analysis of one or another of the chief claims about the use of PEDs (Performance-Enhancing Drugs) in baseball. Though each, including this one, can be read "stand-alone", you really should first read the main page here, which summarizes all of the findings and sets them out them in a coherent presentation. it was last modified on Monday, 21 January 2008, at 19:44 EST. Please, e-mail us by clicking here.